After changning names over the years, Backstop Sports Pub was originally opened in 1931. It was constructed by the Hoover Dam workers as a recreational hall for them to enjoy. Boulder City was a federal government town until 1943, which was the first time beer and wine could be served. In 1969, Boulder City allowed liquor to be served. 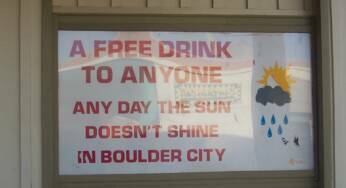 With Boulder City offering over 360 days of sunshine, the Backstop offers a "A FREE DRINK TO ANYONE ANY DAY THE SUN DOESN'T SHINE IN BOULDER CITY."